Mexican food translates well to a healthy vegan diet-living in Los Angeles taught me to love the flavors and spices of this cuisine. Working with cooks from all parts of Mexico was very eye opening, especially hearing about the variety of plants that are foraged and grown in home gardens. And the bright flavors of Mexican food stand out even without meat and cheese! 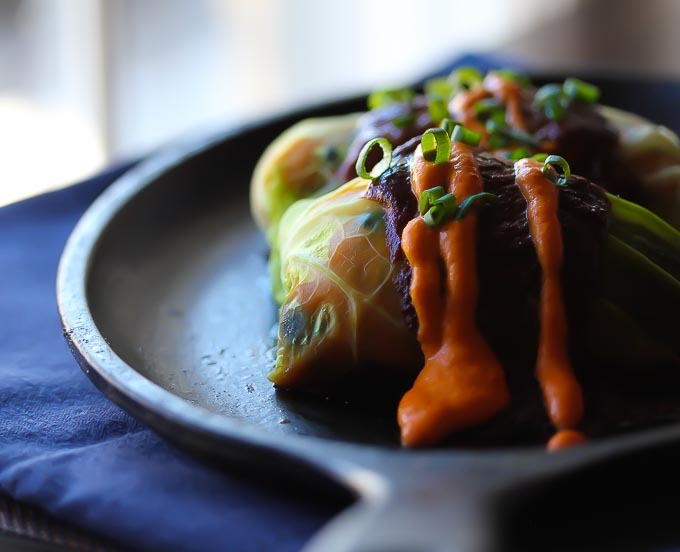 In this version of a common vegan enchilada, I have replaced the tortilla with a cabbage leaf to give it a lighter, gluten free twist, and the molé sauce delivers a delicious, deep flavor. Black bean and sweet potato make up the filling, delivering a nutritious and protein packed entree. Try topping this enchilada with this vegan cheese sauce! Roast tomatoes at 400 degrees uncovered 15 minutes or until caramelized. In a saucepan, heat a few tablespoons of the coconut oil and saute chopped onions, bell peppers, and garlic until everything is caramelized, but not burnt. Add dried chili, hazelnuts and sesame seeds and cook for about a minute until toasted. Add spices and dates and cook briefly until spices are caramelized. De-glaze pan with veg stock, apple cider vinegar and agave. Simmer sauce for about 1 hour until somewhat reduced. Finally add chocolate powder and blend everything until smooth. Set aside until you are ready to assemble enchiladas. Bake sweet potatoes in the oven uncovered for about 30 minutes until tender. Allow to cool and peel off the outer skin. Roughly mash the cooked sweet potato with a fork and fold in black beans. In a few tablespoons of oil, saute the chili, garlic and onion until nicely browned. Fold into sweet potato and bean mixture, followed by the fresh herbs. Set aside. Clean the head of cabbage and carefully remove large outer leaves, taking care to not tear them. Bring a few quarts of water to boil in a sauce pan and blanch the cabbage leaves for a few minutes in the water to soften them. 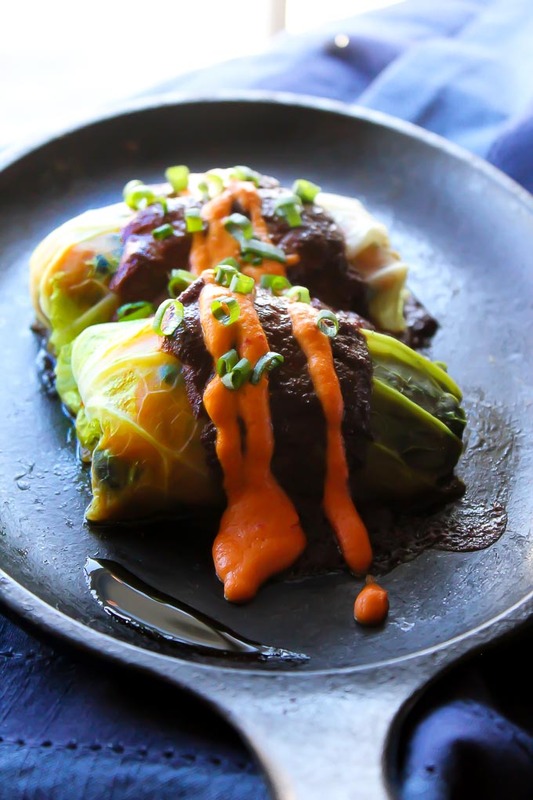 Using the cabbage leaves like a burrito, stuff each one with a few tablespoons to ½ cup sweet potato black bean mixture. Cover with molé sauce and bake in the oven for 15-20 minutes at 350 degrees. Remove and garnish with avocado. I made this for dinner tonight and loved it!! I loved the flavor of the mole, and would never have thought to replace tortillas with cabbage, but am so glad you did b/c it kept the dish from being too heavy. Will def be trying more of your recipes. Thanks for sharing!! Thank you, Stacie! I love hearing when people have good results with our recipes! Hi Michelle! Thanks for the feedback! I know chipotle can be hard to come by-we like powdered chipotle from companies like Mountain Rose. I’m glad you enjoyed it! Let me know how it goes next time! Hi Sara! Thanks for the kind words-I am back in Los Angeles and have some vegan classes scheduled in January at a place called Urban Kitchen in South Pasadena. This series is not raw, but cooked vegan food. We might do some raw food classes in the future-would you like me to sign you up for my newsletter? I will have news about future classes emailed out to my list….